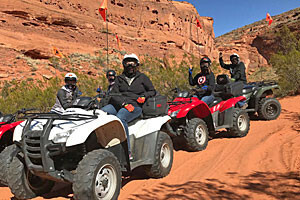 Taking advantage of the Red Cliffs Desert Reserve and Snow Canyon State Park, St. George has created a network of trails for a variety of uses, including biking, skating and hiking. 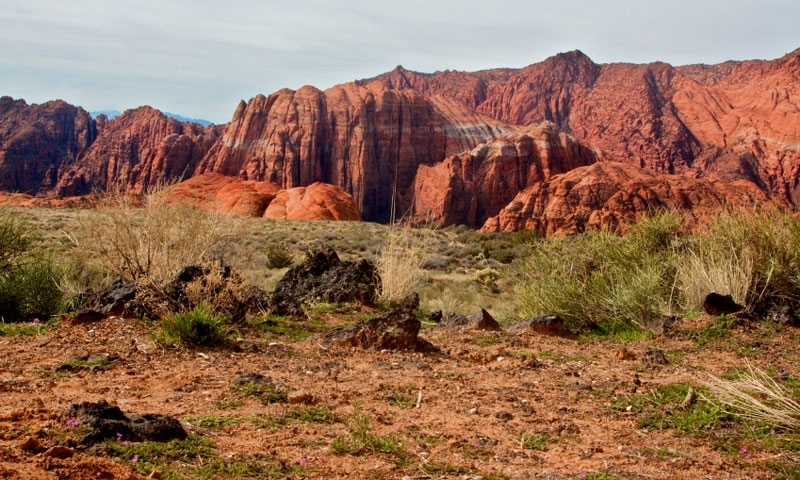 Red Cliffs Nature Trail is a perfect short hike with kids in the Red Cliffs Desert Reserve. Snow Canyon Loop is an 18-mile paved track for everyone, starting in town for a great loop. Just 20 miles east, Gooseberry Mesa is a mecca for mountain bikers who love technical riding through difficult terrain. St. George has a huge system of hiking and biking trails that traverse the local area, exploring the varied terrain. Each trail is unique, offering extensive vantage points of the surrounding areas. Most of the trails are open all year round, but winter conditions are best suited for hiking. In the surrounding area, the options are huge: Sand Hollows State Park, Snow Canyon State Park, Quail Creek State Park, Gunlock State Park, Dixie National Forest, and the Red Cliffs Desert Reserve, just to mention a few. Trail Overview: This is a great hike for kids, or those just wanting an easy stroll in and around the red canyon walls. It ends in a waterfall, so make sure to bring your swimsuit! Trailhead: The Red Cliffs Campground marks the beginning of the trail. This St. George trail is 15 miles north of town, so head to Leeds, then take the frontage road to Quail Lake. The route to Red Cliffs is well marked, so keep an eye out. Notes: Water levels in the pool vary according to season, so be sure to check water depths before jumping in. Trail Overview: This is a short hike that leads to a heritage site of the Anasazi, with stabilized pre-historic Puebloan structures and artifacts interpreted for the public. Trailhead: The trail starts right after the Red Cliffs Nature Trail, so head north to Leeds on I-15, then turn south onto the frontage road. Take the right turn immediately following the turn for the Red Cliff Campground to reach the trailhead. Trail Overview: This loop trail is in the Santa Clara River Reserve, and passes some great views of the Santa Clara Gorge below. The hike is a good balance of length and difficulty, being neither too much or too little. Trailhead: Head north on Bluff St., turning left on Sunset Blvd. After passing through Santa Clara, look for a sign that says "Santa Clara Reserve" or "Cove Wash Trailhead." Follow the signs to the trailhead. Notes: Cove Wash Trailhead has a number of trails coming off of it, so be sure to explore some of the other great trails. Some are also designated for bikers as well as hikers. Trail Overview: This is a short but intense hike to a vantage point looking over two volcano cones in Snow Canyon. Some of the youngest lava in the Colorado Plateau is on the Santa Clara Volcano, which is one of the cones visible along this hike. Trailhead: The trailhead is located on UT-18, so head north from town along Bluff St., which is also the state highway. About 1 mile after the Snow Canyon Pkwy junction, look for a parking area on the right-hand side of the road. Notes: Much of the trail is along newly created lava, geologically-speaking, so sturdy shoes are recommended to prevent injuries from the sharp rocks. Trail Overview: This is an old maintenance trail, which means it's a double track path without any steep sections or challenging terrain. It a great place to go on a trail run or just a walk with some friends through the park. Trailhead: The trail starts at the Sand Dunes, which is located within in Snow Canyon State Park. Take Bluff St. north to Snow Canyon Pkwy, taking a left. Head 5 miles up the road and take a right onto Snow Canyon Dr., which will lead to the trailhead. Notes: Snow Canyon has a number of intersecting trails, so feel free to combine some of the routes to fit whatever challenge you're looking for. Trail Overview: This is a great trail to get the entire group out. Paved the entire way, there's nothing more technical than a couple of steep spots, but the trail still passes through some beautiful turns with views of Snow Canyon's red sandstone and black lava. 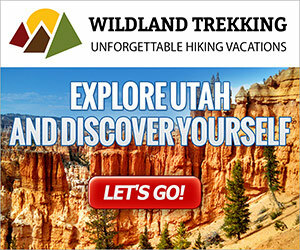 Trailhead: The trail starts off of Snow Canyon Parkway, on the north side of the city on Bluff St./UT-18. After turning left onto Snow Canyon Parkway, the paved trail will be on the right, with parking about two miles up the road. Notes: This is a popular rollerblading track as well, so be aware and remember to yield. Trail Overview: Formerly known as the Green Valley Trail, this is a great choice if you're in the area. It's the perfect mix of challenging terrain for intermediates, but with nothing too scary. It passes around the southwest side of town with some beautiful views overlooking the area. Trailhead: Known as Bear Poppy B, the trailhead is found by taking the Bluff Road exit of I-15, heading west. Next is a quick 'Z' turn, going south on Black Ridge, then onto Dixie Dr. Take a left on W Canyon View Rd, which leads to the trailhead. Notes: This trip can be made into a loop by returning on the roads that connect back into Dixie Drive. Trail Overview: The Gooseberry Mesa is among the most difficult and risky of the St. George, Utah trails, recommended for professional and expert cyclists. There are plenty of places to try out tricky and exciting stunts, while the views and surrounding canyons and mountains make for great pictures. Trailhead: The trail is outside of Hurricane, UT, a little over 20 miles from St. George. Take I-15 to UT-9, heading east. Turn onto UT-59 south, driving 15 miles to the Scenic Byway turnoff. After two miles on the dirt road, turn onto Gooseberry Mesa Rd, parking at the cattle guard after 5 miles. Notes: This trail should not be attempted without proper safety gear. Trail Overview: This trail will battle Gooseberry for the title of best track in the area, but, in the end, they both come out on top. Little Creek is less well developed, but has the same slick-rock riding as Gooseberry Mesa. This is technically challenging, so be prepared. Trailhead: The trail is just past the Gooseberry Mesa Trailhead. However, it's convoluted and difficult, so have a local from a bike shop draw a map for you.